The most important tip I can give about making the perfect burgers, I learned from the master. The master being Bobby Flay. Don’t misunderstand me, he didn’t personally teach me, all though that would’ve been awesome. I just watched a show he did on grilling burgers. If there is anyone on this planet that can make and grill the perfect burger it’s him. Place all the ingredients (or flavorings) you want, to add to the ground meat, into a large bowl, and mix. Next, add the ground meat to the bowl, mix gently with a fork incorporating all the ingredients throughout the meat. This allows for the meat not to be over mixed or compacted by overmixing it your hands. Use a large ice cream scoop to ensure the burgers will be the same size. Patty them gently, with your finger press the center of the patty making an indention, like a dimple. This will stop the burger from shrinking will cook evenly throughout. Crazy right? Believe me when I tell you this works every time. Place all the ingredients (flavorings) you want, to add to the ground meat, into a large bowl, and mix. Next, add the ground meat to the bowl, mix gently with a fork incorporating all the ingredients throughout the meat. This ensures this meat is not over mixed or compacted, by using your hands. Use a large ice cream scoop to scoop the meat from the bowl. This will ensure the patties are the same size. Patty the meat gently, then with your finger press the center of the patty making an indention, a dimple. This will stop the burger from shrinking will cook evenly throughout. Crazy right? Believe me, when I tell you, this works every time. Optional: Season both sides of your patties with Kosher salt and black pepper after you’ve brushed them with Canola oil, then place on the hot grill. Whether you’re using an inside or outside grill, first, make sure the surface is nice and hot. 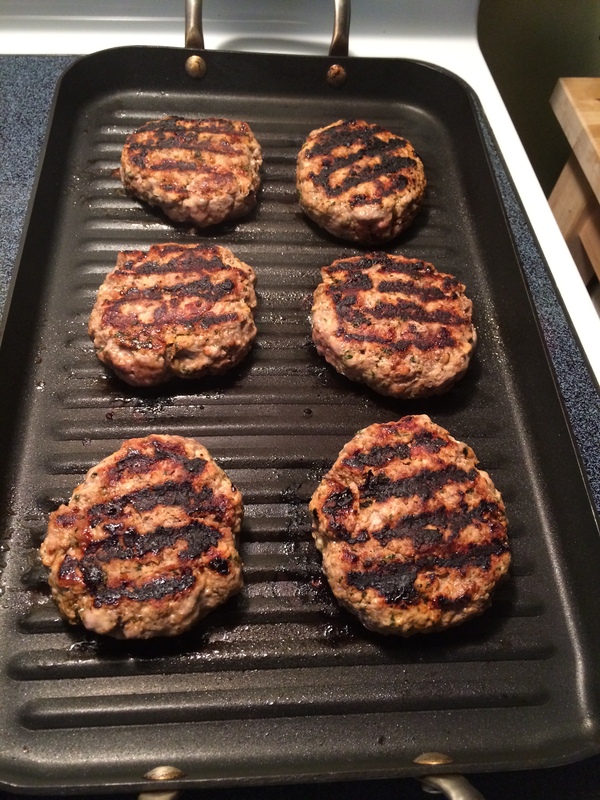 Lightly brush each side of your burger patties with Canola oil and place it on the hot grill. Do not touch them no matter how bad you want to. You should only flip the burger once. Cook the burgers on the first side for 5 minutes before flipping. I grilled the patties on the other side for another 3-4 minutes. After that, I transferred them to a large plate, covered them with foil, and let them rest for 10 minutes. While the burger patties are resting, butter the Brioche buns, place them on the grill. To assemble the burgers. Toast the buns. Lay the bottom toasted bun on the plate. 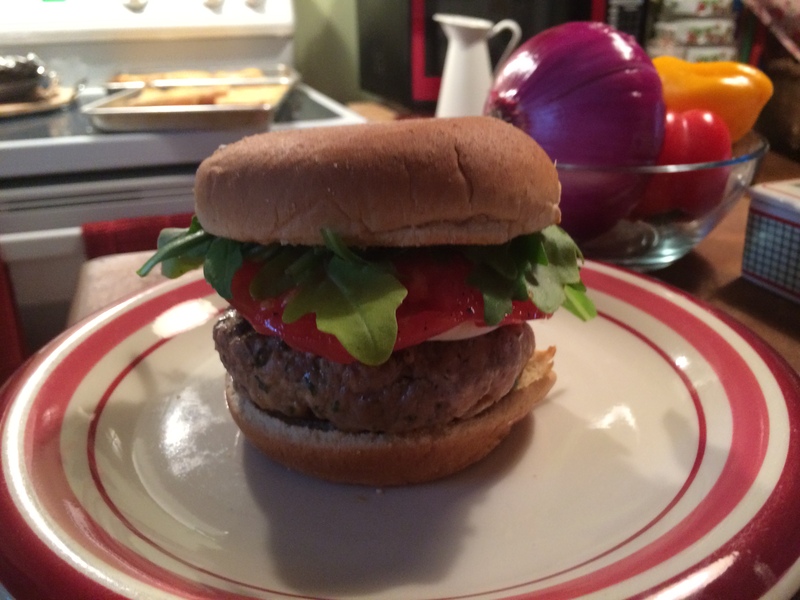 Add the burger patty, fresh Mozzarella, slice of tomato, drizzle of balsamic glaze (optional) a few leaves of fresh arugula, and finally the top bun. Follow this method every time and you’ll have the perfect burgers. Thanks, Bobby Flay!